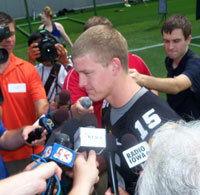 The Iowa football team opens spring drills without Jake Rudock at quarterback. The two year starter for the Hawkeyes may be transferring after C.J. Beathard was named the starter just days after a lopsided loss to Tennessee in the Taxslayer Bowl. Ferentz says Rudock is able to transfer to any school, even one in the Big Ten as they have signed a release with no strings attached. “If he choses to leave, I want him to have opportunities, I think that’s the only fair way to do this, the best thing for him,” Ferentz says. The Hawkeyes conclude drills with an open practice on April 25th.